Built 1766 by Pieter de Swart as a palace for Prince Karl Christian von Nassau-Weilburg. 1802-1804 converted to a theatre by J. van Duijfhuijs. Opened 30 April 1804 as "Nieuwe Haagsche Schouwburg" with Voltaire's tragedy "Semiramis". 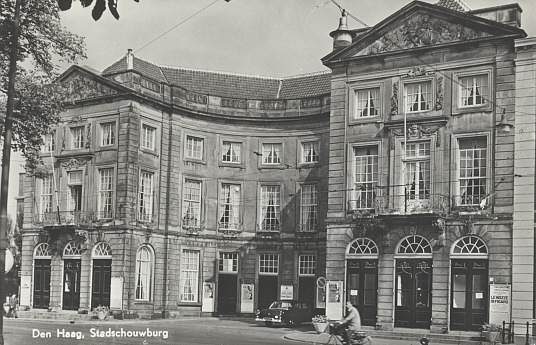 Later renamed "Koninklijke Hollandsche Schouwburg" (Royal Dutch Theatre). 1863 major rebuilding, 1913-1914 foyer and entrance rebuilding. 1941-1942 renamed "Stadschouwburg", 1942-1945 renamed "Deutsches Theater in den Niederlanden", 1945 renamed "Koninklijke Schouwburg". 1976 and 1989 renovations. 1991 foyer alterations. 1996-1999 closed for a major stage rebuilding and auditorium renovation by Charles VandenHove. 2006-2007 addition of a new backstage building by PRO architects for the "Het Nationale Toneel" ensemble. Originally 864 seats, 1863: 925 seats, 1913: 817 seats, 1999: 680 seats. Front Text: "Den Haag, Stadschouwburg"